Tales from the Duck and Cherry: Why All The Questions? When Linnea was four years old, she asked questions all day long. Just like many children, she wanted to know why, who, where, when, what over and over again. A new question would roll off her tongue almost before you had registered the previous one. I taped her one time while she was watching Disney's Dumbo (or Dumbol as she called it, living in Austria where many words seem to end with the letter L). I remember having to muster up all my patience at the time, but it was adorable how inquisitive she was. My husband is also a man of many questions. As a lawyer he is schooled in questioning. He can always see things from many angles unknown to me and asks zillions of questions about things I have never thought about. Still I have reminded him a few times that we are not in a courtroom. On the other hand, he comes from Trondheim and claims that people from that region tend to answer a question with another question. I believe in learning every day and that being curious and interested is healthy and wise. I want to probe and find out, strive forward and learn from life. It does not mean to be fans of Medieval Inquisition, but questions about life, religion, and God are vital for our eternal welfare. And when I find out what I believe to be best and true, I need to trust in that decision. The Italian Renaissance genius Leonardo da Vinci was always learning. I read his personal note book many years ago and recognized how important he believed learning from personal experience was. Still - some things are better left untried. There are pitfalls in life we don't have to jump into. 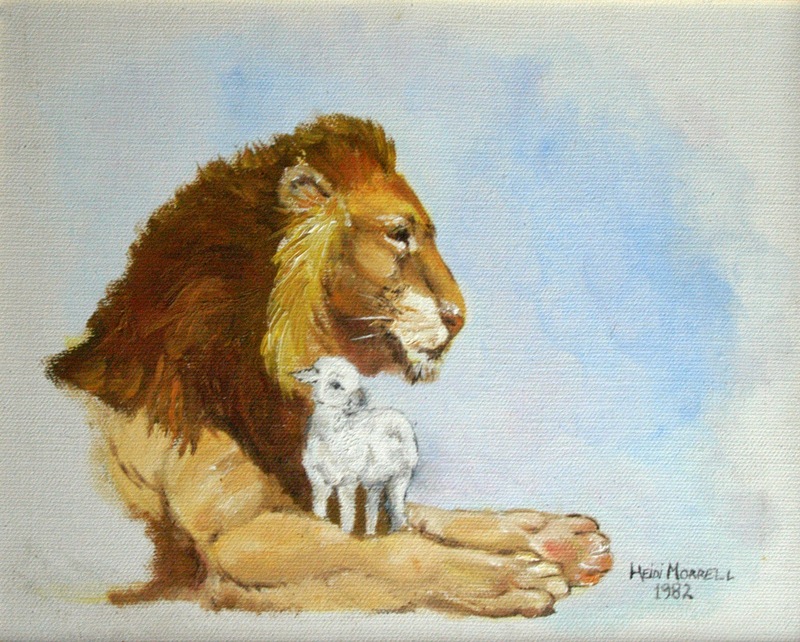 Today's art is an oil painting I did in 1982 of a lamb and lion. I believe it is possible that one day the lamb will lie down with the lion. When that day comes, my big wish is to cuddle with huge bears. Upbeat notes from the life at the Duck and Cherry, our family home. Our family includes my husband Arnfinn, myself (Heidi), 9 children, soon to be 6 sons- and daughters in law, 11 gorgeous grand children (munchkins), one Irish Soft Coated Wheaten Terrier, Hector, and a blue parakeet named Poppy (short for Popcorn)--and it's growing, I should say . . . not counting all the many good friends, who pass by. Check out my other blog about writing good WORDS and reading even better ones! What have I forsaken by choosing to stay home with my children? "And this too shall pass." Mimmi, may I borrow your clothes? The Person Who Changed The World . . . Sometimes dreams are constant, but with alterations. Recept på Ananas paj med twist!